Training for Warriors Portland — This is how you transform your body AND fitness habits. A happy go lucky 53-year-old plant-based eater. He is a serial entrepreneur that continues to stay busy, with his hands on a few different businesses and community organizations. When he isn't working, he and his partner foster rescued pugs of the Pacific Northwest. Talk about a full life! At an annual checkup a few years ago, Thubten discovered that his blood pressure had risen into an unhealthy range, and some changes needed to be made. He had been extremely overweight in the past, and lifestyle adjustments were something that he knew to be very effective. He just needed a little help on the exercise front. 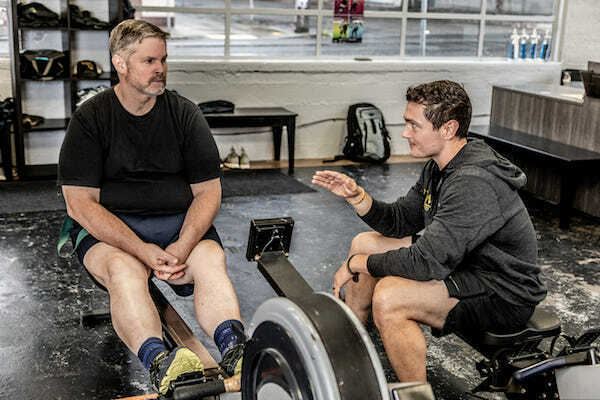 With the goal of burning fat, building muscle, and being resilient in the face of recurring injuries, Thubten reached out to Coach Josh to set up a meeting. Together, they worked out a plan that would involve some basic resistance training to develop his cardiovascular fitness along with building muscle and bone density. In the last month, he has cut three pounds of body fat and built 1 pound of muscle. Numbers like this do not inspire Instagram likes and 6-week challenge photos, but for data people, dropping 1% body fat in a month is a great data point. "If trends continue" is a loaded concept, but 1-2% of body fat lost per month is totally sustainable if you relax, eat healthily, and train simply. That would translate to between 35-70 lbs of fat loss which would be a game changer for you, me, or anyone looking to improve their lives. Change is not some sweeping gesture or miraculous sprint to a photo-finish. It can certainly feel like sprinting sometimes, but more often it feels less dramatic. If you are tracking numbers on your lifts, it is like adding 2 1/2 lb plates to subtly increase the intensity. It is shaving 15 seconds off your 2000M row, or 1000M swim. So here is to Thubten, taking one step at a time and sticking with what works. One set, one rep at a time to bring forth the warrior within.